If you are from British Columbia and looking for a Cocker Spaniel, consider adopting from a well established BC Cocker Spaniel Rescue: www.csrbc.org They have been operating since 2000 and gained registered Charity status late in 2003. We contacted Carol Jackson, the Founder and President, to request an Interview via email. She was kind enough to take some time to answer our questions and she shared a couple of pictures of rescued Cocker’s. Like many rescue groups, the Cocker Spaniel Rescue BC is a volunteer group that does their work for the love of dogs. I hope you find this interview interesting. It’s the first I have done and Carol was very generous to spend the time answering questions from a younger website. It shows the very generous spirit of Dog Rescuers! Carol was kind enough to share two pictures. The first is of Sadie who has found her “forever home”. 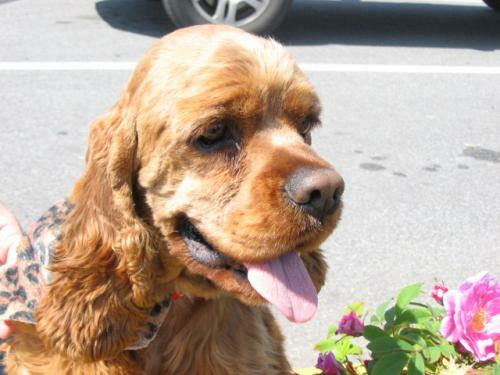 The second, featuring Barkley, a cocker that is up for adoption at time of this interview, follows the interview. I noticed on the website, www.csrbc.org , that your rescue has been operating since at the spring of 2000. How many Cocker Spaniels have been rescued in that time? How has the rescue managed to stay in operation successfully for so long? We became a Canadian Registered Charity in 2003. Donations have been easier to receive. We are all very committed to helping needy cocker spaniels. We have an awesome Veterinarian who gives us great discounts. What are the biggest challenges your rescue faces? Not having enough foster homes. What are the most common reasons Cocker Spaniel's end up at your rescue? I just wanted to clarify one thing about reasons they end up in rescues. You mentioned biting a child as reason that they end up in rescue. I want to be sure that people get a good idea about the breed. Would you say this happens often? I would think not. And is there anything that owners should do to prevent their dog biting a child? The owners need to be VIGILANT around a child and a dog, any dog of any breed. This is not Cocker specific. Even if the dog has a good temperament, children can do things to hurt a dog and the dog either growls or bites back. This is why we do not adopt dogs to families with young kids. They are too busy and the dog is 2nd or 3rd on the list. Because of what they have gone through, rescue dogs need to be first on the list. A child and dogs can be trained to respect each other from the start. If this is done, there are no problems, if it isn’t done, the dogs are destroyed or surrendered to a rescue. In general, why should people adopt from a rescue instead of a breeder? To be correct, Rescues/shelters adopt pets, Breeders sell them. I don’t try to convince people to do one over the other. If they do not want a puppy, which is hard work, then I speak to them about how adopting an older dog is better. The dog has been fostered for a minimum of 3 weeks with us, usually, 2-3 months. The dog’s ‘personality’ and activity level can be better matched with the potential adopter. The dog is housetrained and has other beneficial traits. If they are determined to get a puppy from a breeder, I will refer them to only reputable breeders. Is there anyone that a Cocker Spaniel is not suitable for? Each dog is so different as are the humans. Cockers are suitable for most people. I think someone who is allergic to dander wouldn’t do well with a cocker or any dog, for that matter. Thanks again for sharing your time with www.adopt-a-pet-you-will-love.com . 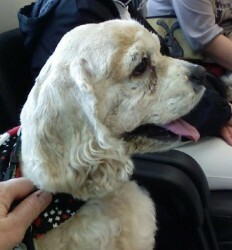 Carol was kind enough to provide this picture of Barkley, he’s waiting patiently for a good home in British Columbia. Carol did a great job on this interview! I really liked her point that adopting from a rescue is beneficial because the dogs personality is well known and can be matched to the person adopting a Cocker Spaniel. Another benefit is that the dogs will have been housetrained. Carol mentioned the vet that is quite generous to CSRBC. This brings up the point that most rescued pets will have had veterinary care including shots. And they probably have been spayed or neutered as well. So you can see that there is a lot of positives about rescuing! I also wanted to comment on the reasons that dogs end up in shelters. Cocker Spaniels are a great family dog. We just have to remember that they are animals and might snap if they feel threatened or are surprised. So it is important that young children are monitored around dogs. Children need to be taught how to behave around animals for the safety of the child and the safety of the pet. I encourage you to visit www.csrbc.org for more information about this wonderful rescue. Thanks again for visiting. We will have more Pet Adoption Interviews done soon so I hope you will visit again soon!